Our textbook, Of Mice and Magic, mentions that Walter Lantz was a survivor (1, 159). Lantz was a survivor for many reasons, as he owned and operated his own cartoon studio for years, obtained the best talent when it was available, and when things went south, had the ability to take things into his own hands and move forward. Lantz’s famous character, Wood Woodpecker, is a survivor just like him. 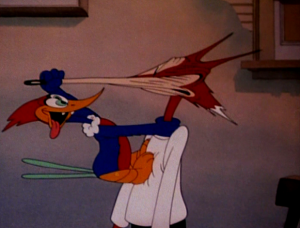 Woody Woodpecker is a character who has the ability to adapt to new environments and situations. Changes in his design, personality, and story structure helped him to be adaptable and enjoyable to this day. When Woody debuted in the early 1940s, he was a character all his own. Though he looked like your typical “screwball” character, with a pronounced chin, big feet, and funny teeth, what set him apart was his crazy, but smart personality. He was an aggressive character who was not afraid to fight anyone. He also did a lot of crazy things to frustrate his opponents, in which they end up becoming crazy by the end of the episode, as in the episode Cracked Nut. Coupled with this, Woody was very smart and was always able to outwit his opponents. So from the start, Woody’s fearlessness, crazy antics, and smarts make him adaptable to new situations as the appeal of cartoons change over time. In the mid-1940s, he not only had a design change, but gained a less aggressive personality. He remained a very smart, only doing crazy acts if it was necessary to get want he wants. He worked in stories with certain themes like Woody Dines Out and Banquet Busters, which deal with food. I found these themes very important as it gives him a purpose in each story and the ability to form the story from his own actions. Because the story is formed by his actions, Woody becomes a character who is able to give and take the consequences of those actions. A good example is in The Barber of Seville. In this episode, his objective is to get a haircut but his actions form a story with him playing as a barber and fixing the hair of dissatisfied customers. He then pays the price of his actions at the end of the episode. Throughout the late 1950s to the early 1970s, Woody was adapted changes as he shifted from the theatrical screen to the television screen. He had a more simplified, square design, adapting to the tastes of the audience and competing with similarly designed cartoons of the time. What also changed were some aspects to his personality and story structure due to TV censorship. I found that Woody lost the crazier side of his personality, though he remains smart to outwit his adversaries. Keeping this trait has made him adaptable as a character where the story itself sets Woody up for his actions rather than Woody creating the story through his actions. An example of this is the episode Termites from Mars, where Woody is placed in a situation where he has to solve a predicament, rather than create a predicament as he has done in the past. 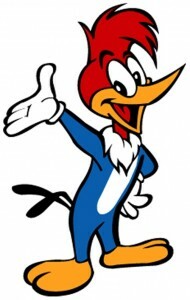 When Woody returned to TV in the late 1990s, he was reverted back to his late 1940s design, but with bigger eyes and a shorter beak. He returned in a new era of cartoons, but I found that there were some similarities to the 50s-70s story structure. In the 90s series, I found that the story, in many respects, was more important than the character itself. Woody, as a character, was very dependent on the story and other characters to carry out his personality. And in some ways, he acted out of his usual character to cater to the story’s needs. 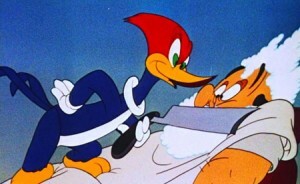 Brother Cockroach and Silent Treatment are episodes that show Woody in a different light for the sake of the story. Though his personality has changed a bit for the stories in this series, it should be noted that his personality is not restrictive, making him adaptable in this era of cartoons. With word out that a movie is in the works for Woody, I find that his ability to adapt to new audiences and tastes throughout the years is remarkable, proving that he will continue to be a survivor for years to come. (1) Matlin, Leonard. Of Mice and Magic: A History of American Animated Cartoons. New York:Plume Books, 1987. This entry was posted in Group 6 and tagged Uncategorized. Bookmark the permalink.